The growing burden of these diseases coupled with uncertain economic conditions in the U.S. and Europe has compelled the OEMs to introduce cost effective devices for treatment of neurological disorders. Tax reforms along with increased regulatory compliance norms are also restraining the growth and profitability of the major companies. Neurological disorders-conditions that affect the nervous system-are on the rise, and so is the demand for treating these conditions. This, in turn, has given the demand for neurology devices a fillip. The market for neurology devices is currently in expansion mode, and this research report charts this growth path between 2013 and 2019. Given that about 12% of all deaths globally are related to neurological disorders, the growth of the neurology devices market will occur in a sustained and organic manner, the report observes. For the purpose of this study, the global neurology devices market has been systematically segmented and sub-segmented on the basis of product types and geographical regions. An analysis of the key performance indicators of the market has been carried out to understand the future course of growth of the global neurology devices market. A market share analysis forms an important part of the report and has been applied to both the competitive scenario as well as the segments (products and geographical regions). The report segments the global neurology devices market on the basis of segments into: Cerebrospinal fluid management devices, interventional neurology devices, neurosurgery devices, and neurostimulation devices. In the same vein, the market is also segmented on the basis of geography into: North America, Europe, Asia Pacific, and Rest of the World. The report estimates the growth of the neurology devices market for a six-year period ranging from 2013 – 2019; whereas 2012 has been taken as the base year for all calculations, unless otherwise stated. Of all deaths linked to neurological disorders globally, 85% occur due to cerebrovascular diseases. This alarming increase in the number of cerebrovascular diseases is a result of the expanding aging population base and a general rise in the diagnosis of and awareness about neurological disorders. To address the growing burden of neurological disorders on healthcare systems, governments are imposing price controls on various medical devices used to treat these conditions. 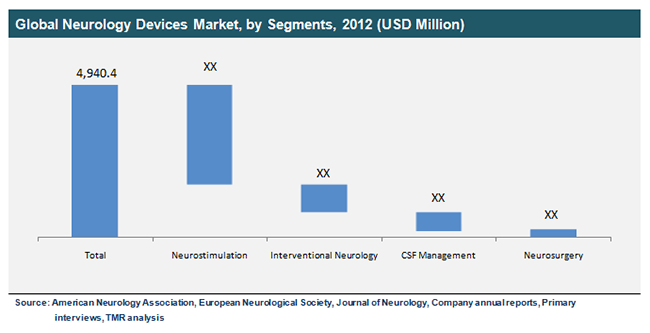 OEMs are thus seen introducing cost-effective neurology devices, furthering the expansion of the market. Although growth is occurring, it is stunted by the presence of various levies and compliance norms being adopted not just by the developed, but also developing economies. This problem is only heightened by an almost-stagnant growth in the neurology devices market in developed countries. This brings developing economies such as China, India, and Brazil on the radar of OEMs in the neurology device market. The sub-segments under the cerebrospinal fluid management devices market are: cerebral external drainage and cerebral shunts. Likewise, the market for interventional neurology devices has been split into: Neurothrombectomy devices (clot retrievers, snare devices, and suction aspiration devices), cerebral balloon angioplasty and stents (carotid artery stents, filter devices, balloon occlusion devices), aneurysm coiling and embolization (embolic cells, flow diversion devices, and liquid embolic agents), and support devices (micro guidewires and micro catheters). The report also segments the neurosurgery devices market into: neuroendoscopes, stereotactic systems, ultrasonic aspirators, and aneurysm clips. The sub-segments analyzed under the neurostimulation devices market are: spinal cord, deep brain, vagus nerve, sacral nerve, and gastric electric stimulation devices. The leading players in the global neurology devices market that have been profiled in the report are: Medtronic, Boston Scientific Group, St. Jude Medical, Cyberonics, and Covidien.